Food from the Heart (FFTH) is a voluntary food distribution program that has a clear mission: to feed Singapore's citizens in need. Last year, FFTH's collection network expanded thanks to a partnership with Singapore's largest supermarket chain, NTUC FairPrice. This new alliance allows the nonprofit to pick up unsold (but still nutritious) canned food products and nonperishable items from FairPrice's 128 stores within a specified time frame every month. But FFTH only has one truck and two vans in its fleet that can be used to collect the donated supermarket goods. "This is a problem faced by many small- and midsized organizations," noted FFTH executive director Anson Quek. "In our case, we had to make sure we were utilizing our resources responsibly while continuing to fulfill our obligations to partners and beneficiaries." In addition to getting the appropriate vehicle to a precise place at the correct time, the charity needed to optimize the capacity of its collection vehicles. Sometimes, FFTH's truck and two vans were being only partially filled up during a collection run, resulting in unnecessary multiple trips, added labor, and increased fuel costs. Working with Esri Singapore, Quek and his team identified and gathered key data that was crucial to FFTH's everyday operations, including the average collection load at each FairPrice location, the collection vehicles' capacities, and the most efficient collection routes. 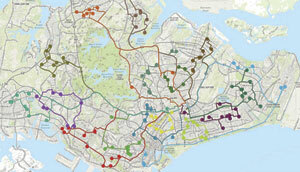 Esri Singapore then analyzed the information using ArcGIS for Desktop and ArcGIS Online. Based on the findings, FFTH adjusted how it collected and distributed food. Instead of devising routes around whoever offered food donations, FFTH used GIS to map out all of its collection spots so it could make the most of its collection journeys. The result was a measureable improvement in FFTH's overall productivity. It led to faster, more responsive service that maximized its new partnership with FairPrice. Esri Singapore also built FFTH a customized version of Operations Dashboard for ArcGIS, which provides the organization with a real-time, synchronized, map-based view of its operations. The dashboard displays all FFTH's collection points plus the amount of bread and goods gathered so far in the day. This helps the organization better allocate its vehicles and volunteers. "Our work entails a lot of logistics planning, and using ArcGIS Online allows us to streamline our workflows," said Quek. "Beyond plotting the location of collection points, [Operations Dashboard] also helps us uncover operational patterns, allowing us to better plan how we can best work with our volunteers, partners, and citizens, given our limited resources." Since adopting a GIS-based solution, FFTH's operational efficiency has improved immensely—mostly because the organization can now commit to precise collection and delivery times. "In the past, we would spend a significant amount of time planning our routes and schedules while also trying to accommodate ad hoc requests for collections," Quek pointed out. "Now we are able to make quick, well-informed decisions on how we can mobilize our resources." Members of FFTH's distribution network can now prepare their donations ahead of time because they know when to expect volunteers, and the organization's beneficiaries get to enjoy punctual food deliveries. Additionally, FFTH has added 40 more welfare organizations to its beneficiary list, enabling it to provide food to a thousand more people than before. Quek added that the recipients of food donations "are also able to better appreciate the truly collective effort of our volunteers and many businesses throughout the community."